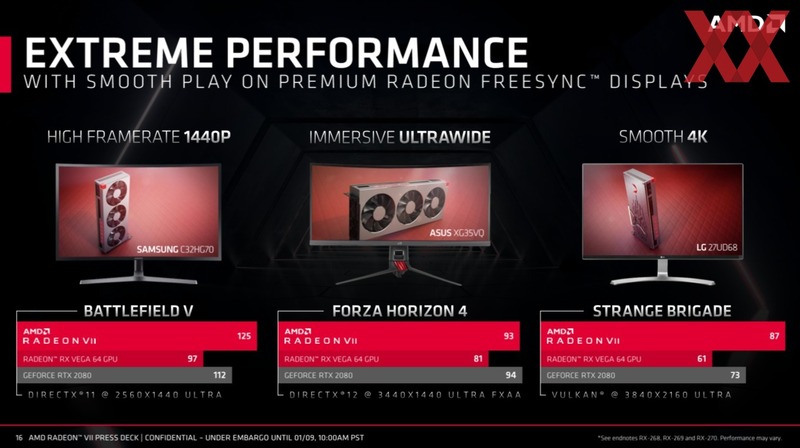 with the purchase of an eligible AMD Radeon™ VII graphics card or Radeon™ VII powered PC. Stay tuned for more information on the program and where to buy at: www.amd.com/raisethegame. The specs for Vega 56 in the Code are wrong. Also it is probably best to have five different entries for Vega. One for 56, 64, Nano, Frontier edition with 16GB, and then VII. Do you want the air and liquid card specs separate too? The specs and code is not correct. Hold your horses! I'm in the process of updating the post, will probably take a few days to get it up to par with the RTX 2080 Ti thread. Too pricey for me given current prices, let's hope they have a lower VRAM variant at a more reasonable price. I play games, not compute so I'd be looking for gaming performance. Was really hoping to buy one as well. This is OCN. I demand perfection! I've seen rumored specs showing that VII will have 2x the ROPs at 128, however this is based on the Instinct MI50 correct? That card is limited to 64ROPs. It's an interesting product, but at this point I refuse to buy any graphics card that is more than ~ $350. Lisa Su said 128 ROPs at CES yesterday.